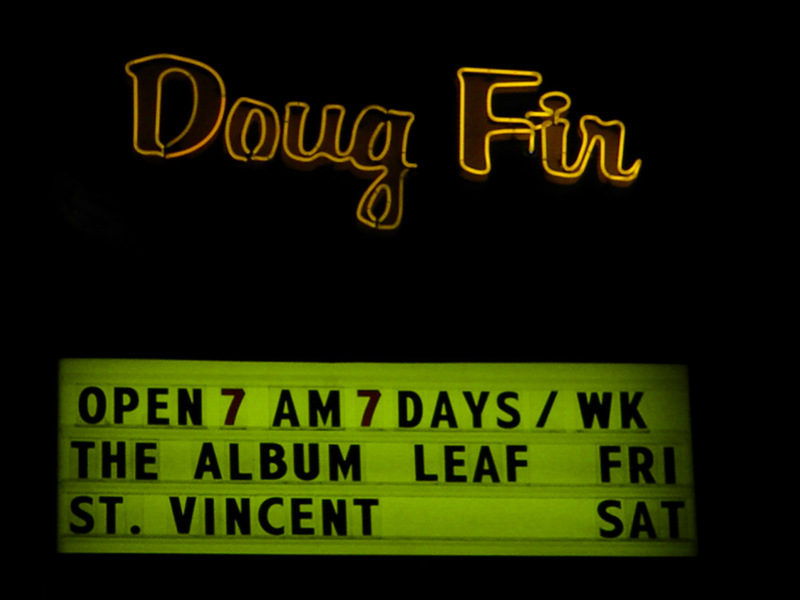 I got into The Album Leaf back in 2004 with In a Safe Place after hearing about the Sigur Rós collaborative songs (and Icelandic former-swimming pool studio). I’ve been a fan of frontman Jimmy LaValle ever since In a Safe Place, which also spanned into a love of his prior band, Tristeza. His mold of organically-infused electronic post-rock fits me well. I missed him on his last time through (Jan 2009); so I vowed not to let it happen again… so this time, I’m hitting both Portland and Eugene, Oregon. 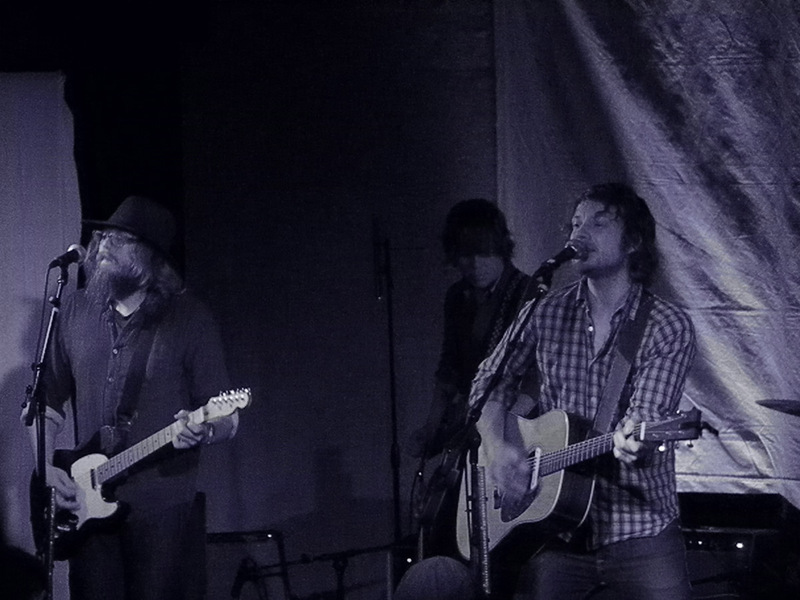 Sea Wolf reminded me a lot of Wilco… maybe it was singer/guitarist Alex Church’s vocals. They have a roots rock meets singer-songwriter vibe that hearkened to Wilco in my mind. They busted out a harder rock tune (in comparison to The Album Leaf), but also had nice cello throughout their set. Great opener… I’m looking forward to Eugene’s show to hear more. After a short break (and a move to the front), The Album Leaf (aka TAL) came on. 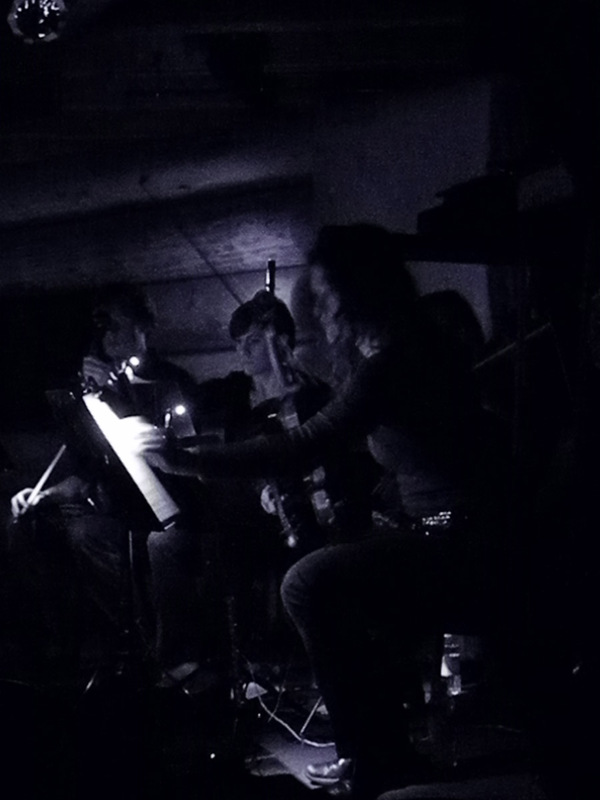 The Portland show featured the Anomie Belle String Quartet (shown at the left), which presumably added nice textures to the already large, six piece band. Where we were lopcated, we could barely hear them. With this new album (see below), Jimmy opened up the recording to more than just himself as well. Previous records were more in the “one man band” realm, with a band assembled for tours. It was nice to the see the band that hit the studio with him on A Chorus of Storytellers play those same songs live. 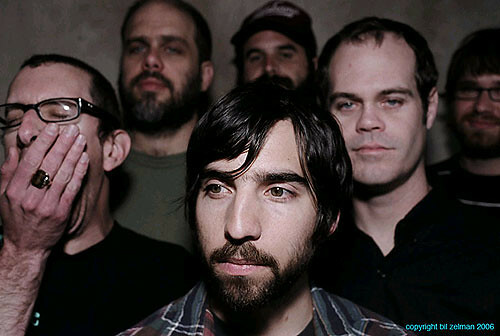 The band was Jimmy LaValle, Matt Resovich, Drew Andrews, Gram LeBron, Tim Reece, and Andrew Pates – all on various instruments. Being the first time seeing TAL, I honestly had no idea what to expect. We lucked out in the placement department… as Jimmy’s gear was right in front of us. The band members switched around on instruments. 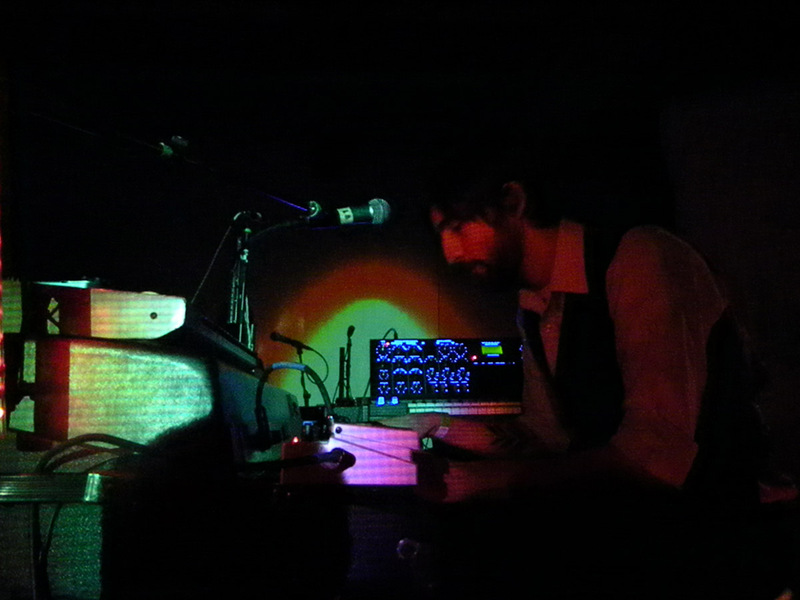 Jimmy played several different keyboards, including a Moog and a modulator of some sort. 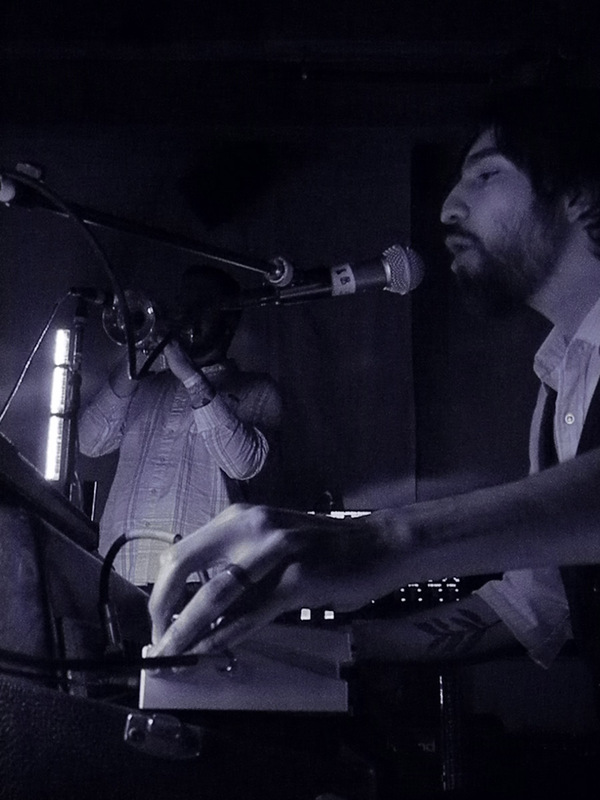 Other members pitched in on keyboards when a violin, trumpet, small vibraphone, bass, or guitar weren’t in their hands. While I still associate TAL as a primarily instrumental band in my mind, their last few albums have had increasingly more vocals. I’d estimate a 1/3 to a 1/2 of the songs had vocals last night – covered by Jimmy, but with frequent backing vocals from various band members. My friend who went along with me commented that the songs seemed fairly similar throughout the show. Alas, I suppose that’s the rub with TAL, but I dug it fairly well. I’ll also be at the Eugene show on Tuesday; so check back for that review next week. Oh, and definitely check out The Album Leaf’s new album, A Chorus of Storytellers. I got it at the show, and it is fantastic! hi there. the “small vibraphone” you mention is actually an instrument called “orchestra bells” or simply “bells”. they are similar to the vibraphone in that they are a metallic keyboard played with mallets. interestingly, the set that I saw Matt Resovich playing with TAL is a beginner model that comes with a practice pad in a set for budding percussionists in school bands. I still have mine from 6th grade! ps – bells are also known as a glockenspiel in mostly formal or old school marching band settings. Cool, thanks for the 411!! Dude thanks for the reviews! I’m catching them in Singapore in Sept and I can’t wait! I hope it’ll be as intimate as the shows in the US. It was so nice coming across this. You and I probably raced to the setlist.